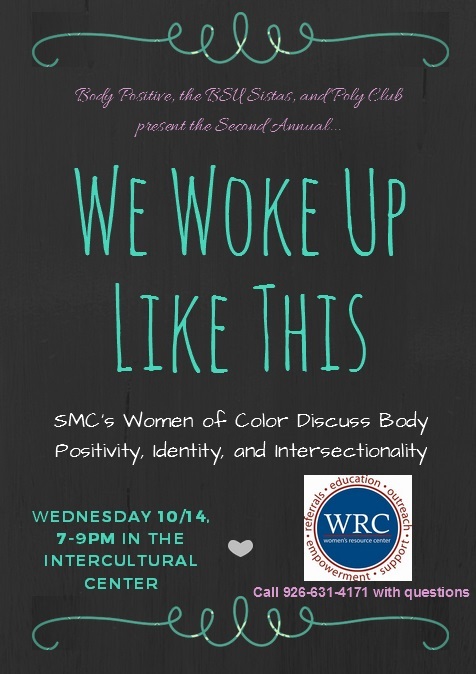 The SMC Body Positive collaborated withthe BSU Sistahs to produce "We Woke Up Like This," a discussion group to discuss body positivity in relation to media representation of women, particularly minority women. The goals of the discussion were to understand why agency is important, understand how the media portrays women of color, and analyze the differences between body positivity for white women vs. women of color. The group viewed and discussed popular media, such as clips from America's Next Top Model, music videos, advertisements, and Halloween costumes.